Want to improve visibility of your site, get more traffic? Best way is submitting links of your site to popular Social Bookmarking Sites. But, with number of sites at offer, this process may take longer! – Enter the URL of the story you want to submit. – Enter the tiltle of the story. 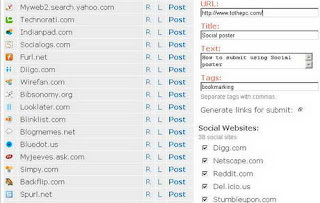 So, get going and submit some quality links from your site to number of Social Bookmarking sites in a fly, interesting!